You can find treasures amongst other people's junk. Just make sure that that electrical item isn't a killer. I'll show you how. My home town refuse disposal service has a profitable sideline. They put aside for later sale other people's junk which still has some serviceable life to it. This little shop is always full of people looking for a bargain. With second, third, or junk hand goods, we need to take some care, especially if the bought item is a mains or high voltage item. Faulty electrical goods have the potential to kill. Recently, I bought a couple of lighting units from this shop. I'll take you through an electrical safety check. This is done before I even begin to think about plugging the item into the mains supply. The above is a student's or bedside lamp. Before examining this lamp any further, I will look for information, such as any safety notices. Note the 'double d' illustration (square within square). This is what I am looking for. This indicates that the lamp is double insulated. Additionally, the 'double d' illustration indicates a standard of electrical safety. Two-wire double insulated electrical goods have more electrical insulation than do three-wire earthed electrical goods. Let's unpack this sentence a bit. Two-wire electrical items (those with two plug-spades [as pictured]) do not have an earth wire. An earth wire, as is found in a large electrical item, such as a washing machine, is designed to channel unsafe voltage to the earth, thereby minimizing the extreme danger to life from a loose or unsound connection. So how can manufacturers get away with wiring only two electrical conductors into their electrical devices? The answer is that they put extra insulation around the wires, thereby making it practically impossible, when the item is used as intended, for the potential for electric shock to occur. My first safety check is to check the insulation. I will proceed from the plug end to the switch, and then to the lamp body. Check if the plug is in good condition. If not damaged, squashed or split, you should then proceed to carefully inspect the cable, up to the switch, for nicks or splits in the insulation. The switch should be good condition. This means that your pulling the cable at either end of the switch does not cause any excessive movement, and that there is no damage to the switch case. Now check the rest of the cable insulation up to the lamp body. If that passes inspection, you should now open the bottom of the lamp for further inspection. The above illustration shows the double insulation. There is a stone material (for weight), and fixed into that are wooden blocks, for the fixing of the screws to secure the plastic cover of the bottom section of the lamp. 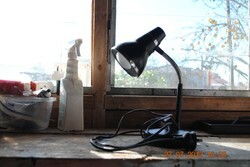 There is also a grommet in the steel body of the lamp through which the cable enters the lamp. These fixtures are the double insulation. Check to see if they are not loose, detached or split. If sound, continue to the next section of the lamp. There is no mechanical stress on the cable between the grommet in the base and the lamp body top or lamp shade area. Additionally, there are plastic (or insulating) moldings at either side of the metallic controlled-stretch device, so we can assume sound electrical safety between the lamp base and lamp shade area. My first task in this area is check if the bulb holder is secure. I will grab this with some pliers and give it a slight tug. If this is OK, a continuity check should be undertaken. Continuity is just a long word for checking if there is no break in a wire or copper conductor. You can do this with a battery and lamp, but I will use a multimeter. A good multimeter will have a function which allows the user to connect one terminal of the meter to one end of a wire and the other terminal of the meter to the other end of the wire, and if the wire is unbroken, the meter will make a sound indicating that there is no break in the wire. As you could imagine, this is a useful function. Having switched to the continuity setting on my multimeter, I will connect one terminal of my 'meter to one of the plug 'spades' or connector to the mains, and the other end to any of the copper fittings in the bulb holder. If the multimeter makes a sound, I know then that there is a good unbroken connection. I take note of which of the copper fittings in the bulb holder produced the connecting sound. I will then connect to the remaining plug spade and will try to find another copper connection, (other than the first), which will produce from the meter a continuity sound. If I discover no such sound , I will assume the switch is switched to the off position. I will then toggle the on-off switch to the on position and try to find continuity (but not to the first copper connection in the bulb holder). At this point of the diagnostic procedure I should get a sound from the meter indicating an unbroken wire. My final safety check is to find if there any continuity between the plug spades and the metallic surfaces of the lamp. To do this I will connect one terminal of the multimeter to any one of the two spades and, using the other meter terminal, check for continuity at the metallic surfaces. You will need to find bare metal (meaning unpainted). Do a similar procedure with one terminal of the meter attached to the other spade of the plug. If the continuity sounder does NOT sound, you can now finally plug your bargain lamp into the mains supply. Success! This lamp is safe to use. (Caveat: For absolute security you need to check the electrical integrity of the insulation. This requires specialist equipment. If you are concerned about insulation integrity, please seek further advice from an electrical professional).